Chipmunks are small rodents commonly seen through all of eastern United States and southeastern Canada. Chipmunks sometimes are trapped for their fur. They also can be tamed as pets. There are 22 different kinds of chipmunks located throughout the world. Their name comes from the Algonquin tribes. Chipmunks are about 6 inches long. Their tail adds another 3 or 4 inches to their length. They look like small squirrels. They have brown fur with lighter brown belly fur. White and black stripes mark their backs. They weigh from 2 to 5 ounces. Chipmunks are best known for the pouches in their cheeks. These pouches can widen to the size of their heads. Chipmunks can carry four nuts on each side of their cheeks and one more in their teeth. They move very fast from place to place. Chipmunks mate twice a year during the spring and summer months. The female then leaves to find a burrow in which to build her nest. After one month, 4 or 5 chippies are born. The female feeds her young with milk for about 1 month. After that time, she takes her babies on hunting trips looking for food. Young chipmunks leave their mother’s burrow between 2 and 3 months. They have to find their own places to live. Chipmunks live up to three years in the wild. As pets, they can live up to 8 years. Chipmunks live in hard and softwood forests. They also like rocky ground. They do not fear humans. Chipmunks build nests under rocks, logs, tree roots, and sheds. They build their burrow all of their lives. They have several “doors” to their homes. Tunnels can be as long as 30 feet. Many doors and tunnels help them to escape from being a meal for foxes, snakes, bobcats, and birds, such as owls. Chipmunks live alone most of the time. They spend much of their time searching for food. Although they are good tree climbers, they prefer to gather their food supply from the ground. Chipmunks are omnivores. They prefer nuts, seeds, acorns, and berries. However, they will eat small snakes, helpless birds, insects, mice, and eggs. 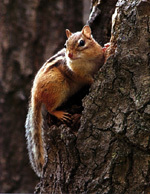 Chipmunks gather their food and store it in their nests or other places underground. Chipmunks do not hibernate. In the winter, they can smell where they have hidden their seeds and acorns. Sometimes, they forget where they have placed their food. In this way, chipmunks help to plant and grow seeds.